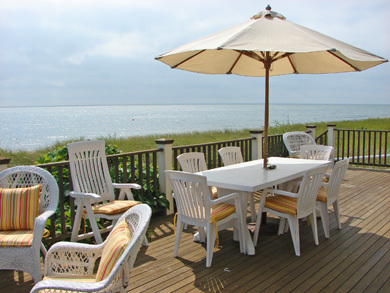 The deck, porch, or patio of your home on Cape Cod, Martha’s Vineyard or Nantucket is actually much more than you think: it should really be considered another room of your home – and a valuable one at that. 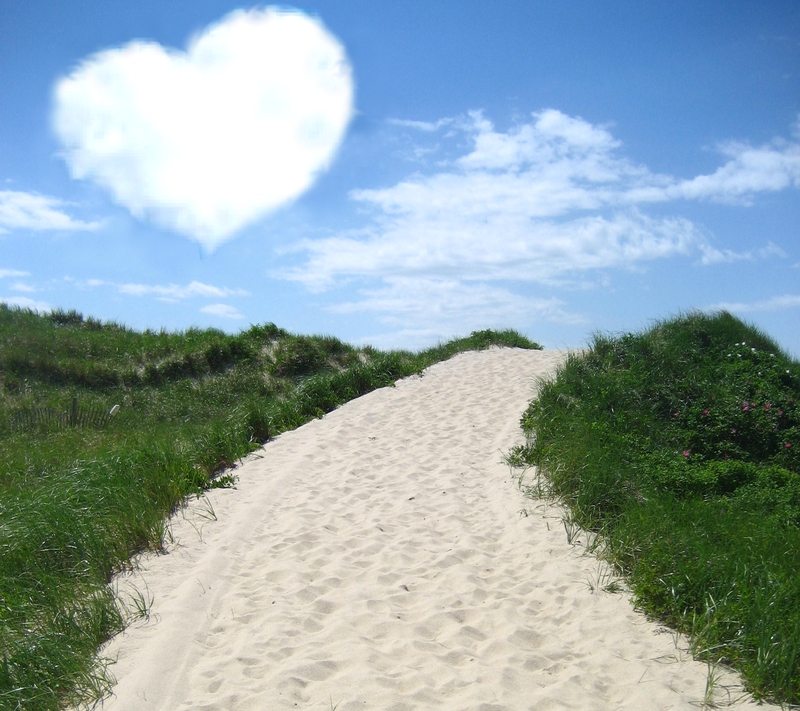 So much of what makes Cape and Islands vacations spectacular is being able to spend copious amounts of time outdoors. And visitors choose to stay in a vacation rental because of access to private outdoor spaces, which provide fun opportunities to dine or just hang out together with family and/or friends. So it’s a good idea to take the time and resources to enhance your deck, porch or patio and make it as lovely as your living room. Here are a few tips to create a welcoming and comfortable outdoor space for your guests. Add some color and comfort to your outdoor furniture by adorning your chairs, chaises, or couches with cushions. Sunbrella fabric is a good choice for outdoor cushions as it is resistant to UV rays, mildew, stains and mold. 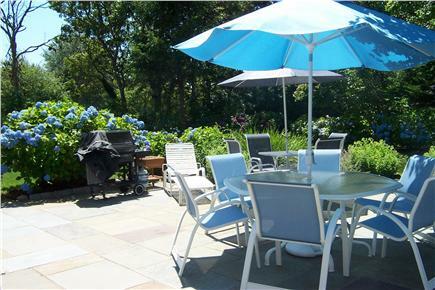 Add another interesting and practical feature, an umbrella, to your patio or deck table. Also, consider providing a freestanding, adjustable umbrella that can be moved to provide shade for your guests depending on where they may be seated and the angle of the sun. 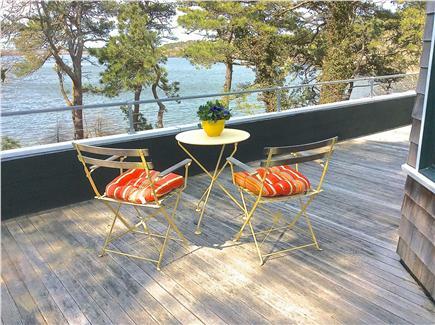 If you have white plastic chairs and table on your porch, add a punch by spray painting them a vibrant, beachy color. Krylon makes a spray paint specifically for this purpose. Add a few cushions, and voila! a comfortable, attractive, and welcoming area for dining and hanging out. An indoor/outdoor carpet is also a relatively inexpensive way to add some color to your deck or porch. And, if you have a large deck, they can help to differentiate the various areas of your deck, porch or patio. Add a hammock or porch swing to your outdoor space. With the addition of some cushions and a small table next to it for drinks and books, you have created an inviting zone set up for relaxing and napping. Low maintenance container gardens are a quick and easy way to spice up your porch, deck or patio. Choose three containers in varying size, and cluster them together at the door that leads to and from your outdoor space, or perhaps in the corners of your patio to define the space between patio and lawn. Cluster them in a triangle and add some with some ornamental grasses, nemesia, or other low maintenance plants. Choose containers that look like terra cotta, ceramic or stone but are actually plastic or fiberglass. Not only are they lightweight, but also, should one get knocked over accidentally by a guest, they will not break. Just be sure to check regularly that what you have planted in the container is looking healthy and, if not, simply replace or remove it. Dead plants are not inviting. Don’t neglect lighting on your porch, patio or deck. Evening is a time when many people enjoy being outdoors, so don’t leave them in the dark. Rope lights have small bulbs on a flexible cord. They can be wound around pillars or along the railing of a deck. Flameless pillar candles are also a great way to add some soft light as well as a nice centerpiece on a coffee table or dining table. Bunch a group varying in height, and place them on a decorative tray to add instant light and charm. They run on batteries, so just make sure to leave some extra batteries for your guests so they don’t get left out in the dark. The outdoor space of your vacation rental home is an important piece in the marketing of your home to vacationers, so take the extra step in creating an inviting space for your guests. And don’t forget to take some nice, new pictures of it afterwards for your listing! Looking for some inspiration? 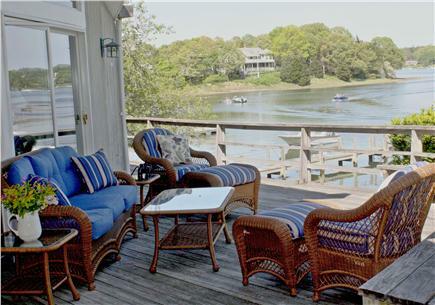 See what some of our homeowners have done with their porches, decks, and patios. Additionally you can peruse the WeNeedaVacation.com Perfect Porches and Decks Pinterest board and our recent slideshow, All Decked Out. Should you need any furniture, decorating ideas, or general assistance designing and decorating your outdoor space, stop by Island Lifestyles in Orleans. The friendly staff can help you to enhance your outdoor space. Share with us how you help your rental guests enjoy the outdoor areas of your home!